Background: Analgesia in patients with fracture shaft femur is usually insufficient as physician usually relies on parental analgesia in such situations. Local anesthetic blockade of femoral nerve to provide analgesia in fracture shaft femur is an under-used technique. We conducted a study to evaluate the efficacy of femoral nerve block (FNB) with 0.5% ropivacaine for acute pain relief in patients with fracture shaft femur. Materials and Methods: A total of 50 patients were studied as they present in an emergency ward. All patients received an FNB with 15 ml of 0.5% ropivacaine. The onset of block, duration of analgesia, patient's acceptance after 24 h together with the effect of block were assessed. Results: The onset of analgesia occurred in 5.34 ± 1.10 min after the block. 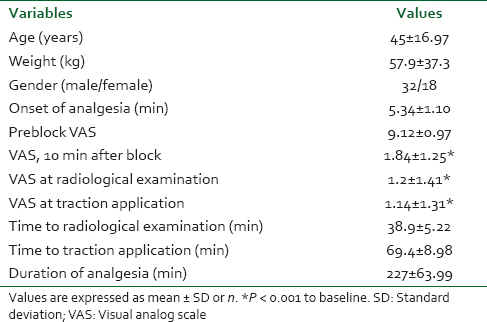 Pain scores decreased significantly from 9.12 ± 0.9, preblock visual analog scale (VAS) score to 1.84 ± 1.25, VAS score at 10 min after the block (P < 0.001). The quality of analgesia did not change when patient underwent radiological examination (38.9 ± 5.22 min after block) and traction application (69.4 ± 8.98 min after block). The duration of analgesia observed was 227 ± 63.99 min. Patient acceptance after 24 h of FNB was good in 86% patients. There were no side effects. Conclusions: It was concluded that in the emergency ward, rapid, effective, and long lasting analgesia can be achieved by safe and simple FNB in patients with fracture shaft femur. The femoral nerve block (FNB) is the simple method which requires minimal instruments with only absolute contraindication, is known hypersensitivity to local anesthetic agents or the presence of a vascular or neurological problem in affected limb. But this simple technique is under-used in the management of pain relief in fracture shaft femur. In this study, we evaluated the efficacy of FNB with 0.5% ropivacaine for acute pain relief in patients with fracture shaft femur. After obtaining Institutional Ethics Committee's approval and written informed consent, 50 American Society of Anesthesiologists status I and II patients suffering from fracture shaft femur were studied. Exclusion criteria were open fracture, neurological impairment, additional injuries, hemorrhagic diathesis, allergy to amide local anesthetics or cardiac or respiratory instability. Upon arrival in emergency ward, a 10 cm visual analog scale (VAS), (where 0 = No pain to 10 = Worst pain ever) was explained to patients and VAS score recorded to measure the intensity of pain. None of the patient had received analgesics or narcotics before FNB was performed. After placing intravenous (IV) cannula, FNB was performed using the following technique (classic approach of LABAT technique) under aseptic conditions: A 23 gauge needle was inserted 1 cm lateral to femoral artery and 1.5 cm below the inguinal ligament passing through the deep fascia. Fifteen milliliter of 0.5% ropivacaine was injected in fanwise manner around the femoral nerve after a negative aspiration test. The onset and efficacy of block, duration of analgesia, and the occurrence of side effects and complications were recorded. The efficacy of the block was evaluated by assessment of sensory block by a pinprick method and comparing preblock and postblock VAS. The degree of sensory block was graded as: 0 = Normal sensation, 1 = Blunted sensation (analgesia) and 2 = Absence of sensation (anesthesia). The VAS was recorded at 10 min after FNB, at radiological examination and traction application. The supplemental analgesic was given when VAS reached 6 or more. Duration of analgesia was considered as the time from placement of the block till injection of rescue analgesic. The patient acceptance was noted by interviewing 24 h after the procedure by using three point score: 1 = Good, 2 = Fair, and 3 = Poor. Statistical analysis was performed using Student's t-test. A P < 0.05 was considered statistically significant. Patient characteristics such as age, weight, and gender are shown in [Table 1]. Preblock VAS score in an emergency ward was 9.12 ± 0.97. The onset of analgesia occurred in 5.34 ± 1.10 min after the FNB. Ten minutes after the FNB, we observed a significant decrease in VAS score, which was 1.84 ± 1.25, compared to preblock VAS score (P < 0.001). The level of analgesia did not change when patient underwent radiological examination (38.9 ± 5.22 min after block) and traction application (69.4 ± 8.98 min after block) [Table 1]. The duration of analgesia observed was 227 ± 63.99 min. The sensory block was found to be complete in 78% patients [Table 2]. When interviewed 24 h after the block, out of 50 patients, 43 (86%) patients graded the analgesia as good. Only one patient graded it poor, as a patient did not find the analgesia provided by the block as adequate [Table 3]. We did not observe any clinically relevant side effects. In the present era of trauma, the number of patients encountered with fracture shaft femur is routinely observed in the emergency ward. It has been observed that such patients have suffering from severe pain and anxiety. Pain causes spasm of the thigh muscles, leading to displacement of the broken bone ends and so, adds to a vicious cycle of more pain and consequent spasm. These patients need various types of interventions like radiological examinations, traction application etc., and, therefore, needs some kind of anesthesia or pain relief to perform these procedures. A patient with fracture shaft femur present at hospital in severe pain that arises from periosteum which is one of the most sensitive structures in the body. Little detail is available concerning the nerve supply of the periosteum covering the shaft of the femur. In general, the periosteum of superficial bone derives its nerve supply from the nerves to the overlying skin while in deeper bone, the motor branches to nearby muscle provide the supply. It seems likely that the nerve supply to the periosteum of the femoral shaft is derived principally from the femoral nerve supplying quadricep femoris muscle which has motor attachment to the shaft of the bone. Femoral nerve block has been shown to be an effective method of providing safe postoperative analgesia in bilateral femoral shaft surgery  and when it is performed during prehospital management of fracture shaft femur. Lopez et al. used a fascia iliaca compartment block which also blocks femoral nerve to provide pain relief for patients with fracture shaft femur when used in prehospital care. Bupivacaine is a well-established long acting local anesthetic agent. Ropivacaine is also a long acting local anesthetic agent with characteristics similar to that of bupivacaine. We had chosen ropivacaine for FNB as it has lower systemic toxicity than bupivacaine. Bupivacaine has been associated with cardiotoxicity when used in high concentration or when accidentally administered IV. A review of the literature suggests that ropivacaine has lowest potential risk of cardiotoxicity for accidental IV injection. In our study, the FNB provided rapid and prolonged analgesia with comfort in patients with fracture shaft femur. The analgesic effect of the FNB and paralysis of quadriceps allowed pain-free radiological examinations and traction application. Adequate traction will, of course, also relieve pain; however, this should humanely be done once the FNB has taken effect. Traction application will, in any case be easier once muscle relaxation has occurred. The other advantage of FNB is pain-free transportation of patients for radiological examination and other orthopedic manipulations. Thus, we concluded that in the emergency ward, rapid, effective, and long lasting analgesia can be achieved by safe and simple FNB in patients with fracture shaft femur and makes patients comfortable during transportation for various radiological procedures, traction application and other orthopedic manipulations. We also recommend that FNB should be included as the part of primary treatment for patients suffering from fracture shaft femur in an emergency ward. We wish to thank Orthopedic Department for their cooperation. Hennes H, Kim MK, Pirrallo RG. Prehospital pain management: A comparison of providers' perceptions and practices. Prehosp Emerg Care 2005;9:32-9. McGlone R, Sadhra K, Hamer DW, Pritty PE. Femoral nerve block in the initial management of femoral shaft fractures. Arch Emerg Med 1987;4:163-8. Last RJ. Anatomy: Regional and Applied. 5 th ed. London: Churchill Livingstone; 1972.